Why is your nick / name in lower case only? what's on my mind? food. and a drink. If you look at it, it's a mirrored image. 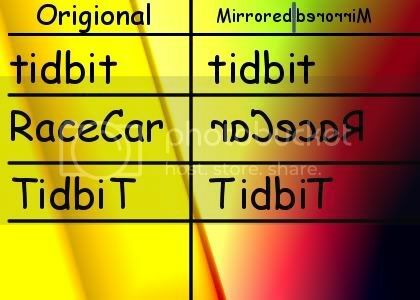 tid is the mirrored image of bit in lowercase letters. Hmm next week I have to work at the morning, it's been 6 months I've worked at the afternoon. I've always thought this myself, and was curious when tidbit didn't actually acknowledge it in the answer/post. you realize the first link has an explaination + sample and the second link has a few samples? In my above post that is. Debating on whether or not I should complete the American Community Survey. From what I see, this is an attempt by my government to obtain information they have no right to. This is a supplement of the Census (Which I did complete and return) that is asking for information that I feel is personal and private. What time I leave my house to go to work. How many hours on average I work a week. My primary function at my job. What dates I served in the military. If I am disabled due to military service. They are threatening that there will be fines/imprisonment if I don't comply. Interestingly enough, the Constitution's Fourth Amendment states that I only have to give the number of people living in my home and their names. Now If I knew that the government was keeping this information secure, I would probably not have much of an issue, but, even though they claim they are, I have worked for the government, and I know that almost none of their information is actually secure. When I was in the military I received several (3+) notices that a thumb-drive or laptop that possibly contained my social security and or medical information was reported missing. Isn't it great living in a "Free" country where they threaten you to disclose personal and private information under penalty of fine or imprisonment? my computer is making some funky noises. doesn't sound to serious, and they are quiet.